This may not immediately seem relevant to the current DamonCarltonandaPolarBear.com poster reveals but please read on and you may change your mind. 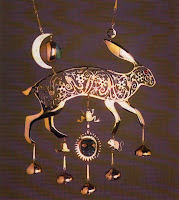 In 1979 an Englishman called Kit Williams created a jewel encrusted, golden Hare, this was the prize for the person that discovered it's location. The hare was buried in a ceramic casket on public land in the shadow of a cross on a hill in England. The clues to the location of the hare were contained in a story, published in a book released in 1979. The story is about Jack Hare who trys to carry a treasure from the Moon to her lover the Sun, however the treasure is lost on the way and the reader of the book is left to find the location. Apart from this being an example of a treasure hunt, it is also a forerunner of the modern web based ARG as we know it, the clues in the book took the form of 15 paintings, with an extra 16th clue being released later in a national newspaper. 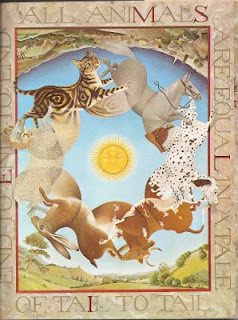 The clues were typical of the ARG clues that we are used to, for example each poster had a hidden word or series of words that, when combined, anagramed and unjumbled, consisted of a phrase that pointed to the location of the Hare. One of the paintings contained a clue on what order the words were placed in. The obvious words on the border of each picture are other subtler clues and in some cases completely irrelevant. e.g. one poster has the word Herring, where all the letters are Red. The extra clue published in the newspaper had a series of animals around the main figure in the picture, the first letters of which spelled out "Merry Christmas", so this was an example of interaction with the audience of the game. There were even false clues, for example a magic square, where the numbers equated with Atomic Numbers from the Periodic Table and when the element letter abbreviations were substituted it translated to "FALSE NOUU THINK AGAIN". 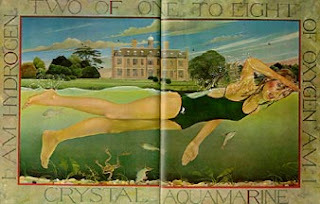 One image (left) contains a picture of Sudbury Hall which may be a clue to the inspiration for the idea of the game as a version of Poisson's Shepherds of Arcadia painting was kept there at the time. That painting is itself said to contain hidden clues that are supposed to provide hints to a hidden treasure, this treasure is explored in the books "Holy Blood, Holy Grail" and "The Da Vinci Code". The prize was claimed in 1982, but it was later revealed that the person claiming it did not solve the puzzles, he had some inside help from the former girlfriend of the creator of the game. The first people that solved the puzzle as intended, only a short time after the prize was claimed, included someone with the surname Rousseau. 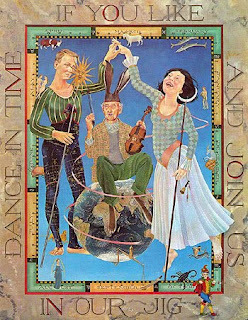 It's 30 years since the book was first published and hopefully you can see the link with Masquerade and what we are currently engaged in. There is no suggestion so far that we need to go and start digging up vast tracts of countryside in search of a golden polar bear, however it may well be that there are clues in the posters to a larger prize of some description. I hope this post is not too off topic, we can use these comments to discuss the possible hidden meanings in the posters and the previous one to discuss general DCaaPB things. So far I haven't seen anything obvious in the posters that links them all together, apart from maybe the Dharma symbols and the numbers, but maybe the 16th poster will contain the key ? I agree Zort. (This is Kyle, from the Boston stop). The riddle that is DCaaPB will have a bigger payoff than the ostensible posters. I don't think it'll be tangible in the Golden Hare sense (the posters themselves act as that, since they're so one-of-a-kind) so much as it'll be intellectual: The answer to the ARG will provide insight into what next season will be about, and, in turn, the overall LOST mystery. Just wanted to say, great research! Very fascinating. I can definitely see how this is relevant. I also think this knowledge can help us in our pursuit. Thanks for sharing. Kyle - Yes I think those of us that are participating will get a lot more out of the final season than someone who is a more casual viewer. There was also a children's book a few years ago with hidden clues throughout the book and several actual jeweled/golden insects were hidden in plain sight around the real world for people to find and keep. Kevin - I think the book you mean is A Treasure’s Trove, this was mainly a US based thing as I recall. There was a follow up with a more global reach - Secrets of the Alchemist Dar, which has apparently just ended without any sort of idea as to why. I think the people behind it went bankrupt. By "...just ended..." I mean it ended abbruptly a couple of years ago, not that it has ended recently. Secrets of the Alchemist Dar: Wiki page in part: As of June 2009, news has appeared that the hunt is canceled and that the rings will go to auction, with the .59 carat red diamond to be auctioned September 19, 2009 in NYC. WOW, Zort, great research. It would be awesome if all these obscure "errors" will lead to the 16th frame! I was wondering if all the words in the poster titles may need rearranging at the end and the 16th poster will give us the clue on how to do it. Locke's numbers cause Dharma van to crash. Totally love the post, and it is what ihave been thinking too. When I have more time I will redo the hires shots for each for better scrutiny. Maybe the odd spaced letters will pay off finally too. I think that was a little - a lot! - more intricate than this, but when you consider that people the world over worked, some of them, day and night for years before the Hare was found, it shows the magnitude of the book's complexity, and, since Masquerade, I don't think there can have been anything apart from LOST to have stumped a willing, interested, time-giving audience quite so thoroughly. A nice comparison for the overall show but I'm not sure this ARG will have anything quite so shiny and fantastic at the end of it! Zort...I am liking this very much...I think the individual websites may be a clue as well, as this is where we may need to get the words for the final website to find the 16th poster. Wow Zort- good job on the post. I think it will totally turn out to be relevant based on the similarities and the strange saying that was on the RMA website. Something will definitely be different about #16 with the red "?" Maybe I shouldn't frame my Locke poster just yet! That is beyond cool. Thanks for posting it. FRAME 5 HINT IS UP!!! GO RUN! NOT SURE WHY I'M YELLING! I'M NOT SURE WHY YOU'RE YELLING EITHER? Looks like we're going international. The Arizona state flag to the side of the U.S. flag was the tip-off. And the U of AZ flag is on the other side of the U.S. flag. Oh, holy cow, good work! Excellent. going to look around U of AZ now. Any LOST conntections? So do you guys think this means something will go down at the UAZ? Or is it wayyyyy too much of a giveaway? what? where is the clue, my DCAAPB site is the same. But if there's any clue that includes AZ...well I'll be on it! Even if it's in Tucson....although I'm going up to the Grand Canyon tomorrow and won't be back until Sunday evening! I can access the picture if I click the "hub" but there's no pic of Paul et al in the frame for me. Your joking, right, Scoutpost! I just posted that the Grand Canyon has a connection with Hurley. I am looking at "The Crash" poster and I noticed that there are 5 cuts total shown: 1 on Sawyer, 3 on Jack, and 1 on John. Maybe it's just a coincidence, but I wanted to point that out. Nobody will ever believe me, but I was just having trouble sleeping (it's 04:30 here) and I suddenly had a thought that a new clue for frame 5 had been posted. Sure enough I turn my PC on and there is a new clue. I'm scared that I'm now in tune with the DCaaPB web site ! My sister has that Masquerade book! Wow I remember reading it as a kid.